Lunchables Is Unleashing Brunchables. Yes, for Real. 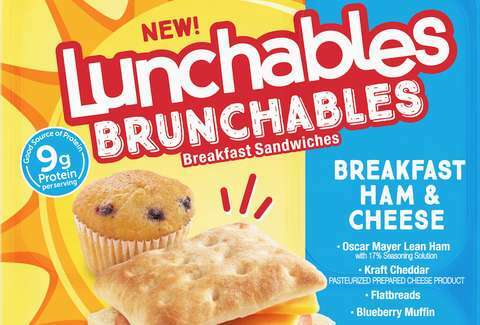 You're not going to believe this so we're going to say it twice: 1) Lunchables is releasing Brunchables. 2) Lunchables is releasing Bruchables. Lunchables didn't help its case when they teased the new dining option as an April Fools' Joke. But it's real. As proof, consider that the website is even named BrunchablesIsReal.com. Once they hit shelves this spring, Brunchables will come in three forms: Breakfast Oscar Mayer Bacon & Kraft Cheddar Cheese; Breakfast Oscar Mayer Ham & Kraft Cheddar Cheese; and Breakfast Oscar Mayer Sausage & Kraft Cheddar Cheese. Each will come with a breakfast flatbread and a mini blueberry muffin. Unfortunately, there won't be a mimosa in one of those delightful juice boxes, but you can't have it all. If you can't wait till spring, you can head to that -- again, real -- website, and enter yourself get your hands on Brunchables before the rest of the public. You just have to enter by April 4. If you do win, you'll get a six pack of Brunchables and a Lunchables T-shirt, an enviable garment to be sure. Obviously, there's nothing stopping you from eating a normal Lunchable and drinking champagne in the afternoon and calling it a Brunchable, though.